The Observer and the Watkins Glen REVIEW&EXPRESS, are two long-standing, national award-winning weekly publications that are designated as “official” papers for the county seat communities of both Penn Yan (Yates County) and Watkins Glen (Schuyler County). The newspapers are located in the heart of the Finger Lakes wine region with many of our communities located along Keuka Lake and Seneca Lake. 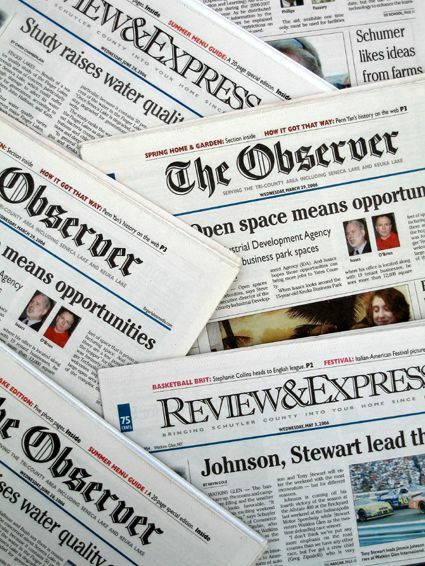 The Observer is based in Dundee, New York and has published continuously since 1878. Our readership area consists of the three-county area of Yates, northern Schuyler and Steuben. The Observer also covers the three school districts including Penn Yan, Dundee and Hammondsport along with the more than fifteen villages and towns in the immediate area. The Watkins Glen REVIEW&EXPRESS is published from Watkins Glen. Schuyler County is our area of focus and the popular weekly has been published since 1854. The REVIEW&EXPRESS has covered the exciting birth of road racing in Watkins Glen and the growth of the Finger Lakes wine industry that has become a leading producer of many wines that are internationally ranked. Today, our community and Watkins Glen International is the venue for popular NASCAR racing. The REVIEW&EXPRESS is the ‘official’ newspaper for Schuyler county and also for the Watkins Glen and Odessa-Montour school district. coverage areas. Our parent company, Finger Lakes Media, Inc. now publishes newspapers, an online edition at www.observer-review.com, the most popular visitor’s guide in a four-county region of upstate New York, along with additional specialty publications targeting specific demographics throughout the year.